This outfit is run by an enterprising young man - Subash Tamang. He has named his operation after his daughter. His office is located on Nehru Road that leads to Mall and next to Keventer's restaurant - a prime commercial location. 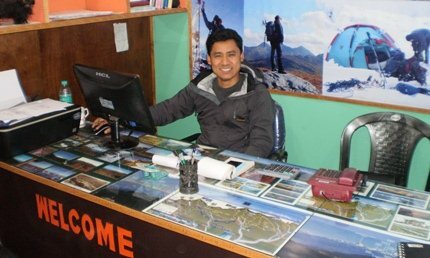 It's a nicely done up office, quite cozy, and has great pictures of tours and treks which Subash has himself taken. You can also see the several award certificates on the walls. Ashmita Trek & Tours is one of the best in Darjeeling area when it comes to trekking, day trips and sightseeing tours. They have excellent guides and a good network of professionals. 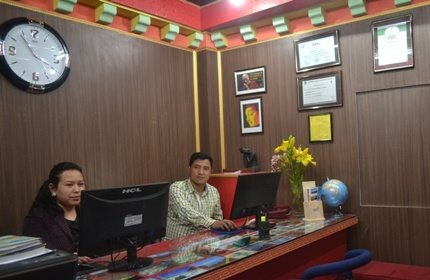 They also have cars of various makes in nice conditions and offer pickup & drop services from/to NJP station or Bagdogra airport, and also transfer services to nearby places like Gangtok, Kalimpong, Pelling etc. 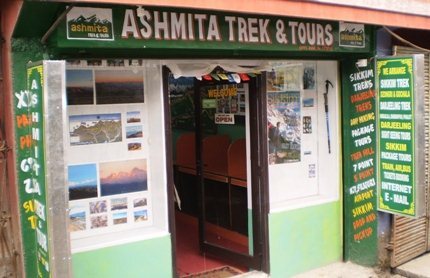 In April 2018, Ashmita Trek & Tours has been accorded the status of Recognized Tour Operator / Travel Agent by Department of Tourism, Govt. of West Bengal. 5) One day hiking tour that includes local culture, history and heritage sites. 6) Langtang Gosainkunda Helambu trekking in Nepal etc. 3) Car makes include Innova, Xylo, Qualis, WagonR, Santro etc. Ashmita Trek & Tours is a partner of Darjeeling Tourism Card and offers attractive discounts to card holders in trek packages, tours and transports. 3A Nehru Road, Opposite Planters Club (near Keventers), Darjeeling, West Bengal 734101, India. 3A Nehru Road, Opposite Planters Club (near Keventer's), Darjeeling, West Bengal 734101, India. The original office of Ashmita Trek & Tours was located on Zakir Hussain Road, a lane that originated from the Chowrasta (Mall), and required 3-4 minute walk past the horse stable. Subash has grown his business over time with sheer quality and hard work. The result is his new office on Nehru road which is considered the most premier location in Darjeeling.